BJC – Inspired Soles – Artworks PHX – a business-arts campaign in Phoenix, Arizona USA. Inspired Soles – Good for the Soul. Good for the Community. 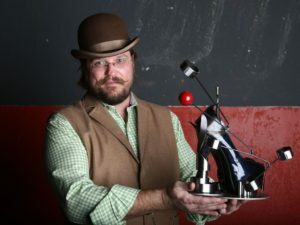 When BJC, a Santy Company dreamed up the idea for Inspired Soles, they hoped the local arts community would be intrigued by the invitation to transform a black stiletto into a work of art. They were pleasantly surprised by the response when more than 35 artists and creatives representing ad agencies, tattoo shops, design firms, jewelry and clothing boutiques, and even bakeries rose to the challenge. The result was an incredible exhibition featuring stilettos like they have never been seen before. The works of art were auctioned to the highest bidders, and proceeds benefited Artlink, a nonprofit organization that promotes arts and culture in the city’s urban core. The show was such a hit that BJC brin gs it back every year on First Friday in April. Over the past five years, Inspired Soles art show and auction has more than doubled in size and rotated through downtown Phoenix arts venues that can accommodate the increasing number of artist shoe submissions, and crowds. The show has become a signature downtown Phoenix event, promoting the unique artistic culture of the local community and generating more than $15,000 for Artlink. 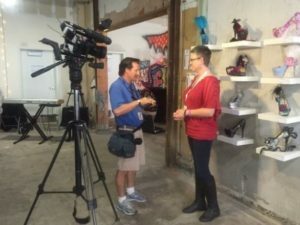 Artists appreciate the annual opportunity to connect with new arts patrons, and are frequently tapped to create shoes individually for attendees who want to purchase Inspired Soles after the show is over. The benefit to BJC is loads of publicity each April, and new relationships with the local arts community, community leaders, and clients looking to initiate their own collaborations with the arts community.